Picture courtesy of Rakesh Bedi. A Lisburn man has described his shock after an oil tanker crashed into a wall at his parents’ home and flipped over. 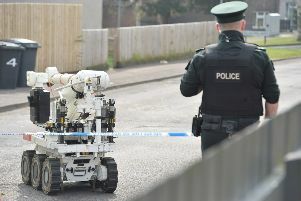 Rakesh Bedi said his brother first discovered the collision at the family home, on the Derriaghy Road in Lisburn, when he was picking up his daughter from school earlier today (Friday). Thankfully, there were no serious injuries following the crash. “The house itself is fine but the wall has taken some beating,” Mr Bedi said. He continued: “It was some welt he must have hit it to flip the tanker over. A police spokesperson announced the closure of the Derriaghy Road shortly before noon on Friday, following the single-vehicle collision.